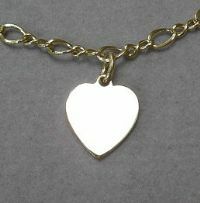 You can personalize and wear this heart charm on a neck chain or bracelet. See our available chains below. 9/16 inch wide x 10/16 inch high. Engraving on one line (up to 8 characeters ) is included in the base price. For an additional charge, you can have engraving on a second line on the front or engraving on the back. Personalize with names, dates, or a special saying. Please click here to read the terms of engraving before ordering this product. Select gemstone dangle and chain options below.